We take a salt cured pork skin with the fat melted off and cook it in pure olive oil using a unique process. The result are light fluffy crisps with the fat content of potato chips, no carbs, and a significant amount of protein. Pork Clouds are an excellent, carb-free alternative to traditional snack foods. 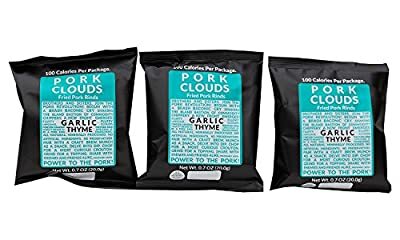 These crisps are seasoned with thyme against a garlic background. Ideal as a hummus dip or Levantine dish pairing.